yeah, yeah, I know, I know, it's free cone day over at Ben & Jerry's... thing is, I've only got about a half hour for lunch total and I'd rather not spend 45 minutes in line for a free ice cream. The parking lot was full and there were dozens of people lined up outside.... I think it's time to go to DQ. 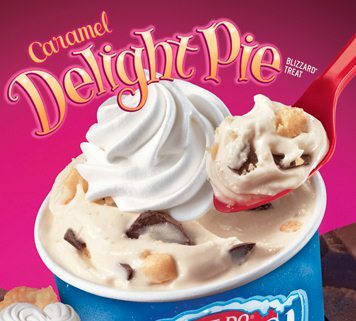 The April 2012 blizzard of the month is the "new" Caramel Delight Pie blizzard... you know you are in trouble when the lady behind the counter goes "what's it called?". The name doesn't flow, plain and simple, so let's focus on ingredients: Caramel, choco chunks and pie pieces blended with creamy vanilla soft serve crowned with whipped topping. Shocking, no whip cream! Sure, I'll live, but this always seems to happen with pie based blizzards. The caramel flavor is DQ's typical caramel flavor. It's by far the overriding flavor in this mix, but it's not what wins the show here. Notice the crazy amount of chocolate chunks in my serving. I saw that the nice lady did a double scoop and the chips are what make this one fun. These are good size, thin chips that add just the right crunch to the scattered pie bits. Thicker chunks would have thudded, and small chunks would have gone unnoticed. Literally every bite was plesantly crunchy (which I loved of course). So I've got no complaints on this blizzard. It's different and tasty and I just had the sudden urge to get it with heath bar next time, mmmmmmmm. Sorry. 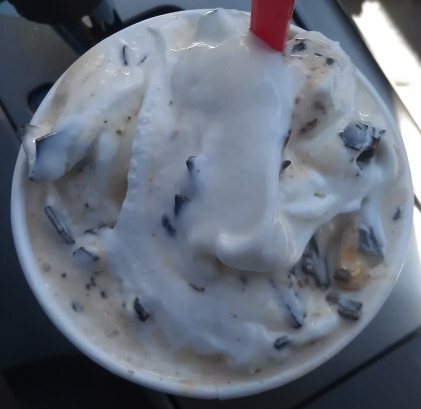 This one definitely gets a recommendation for those of you who like to try all the blizzards. You won't be disappointed (unless someone does a terrible job making it).